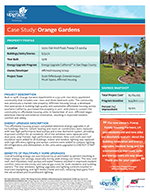 Through the Energy Upgrade California Multifamily program, Affirmed Housing Group completed a major rehabilitation of Orange Gardens, a 38-year old apartment development. Upgrades included high performance heat pumps and ductwork system, dual pane, vinyl framed, high performance windows, new cool roofs and roof insulation, indoor and outdoor high efficiency lighting and sensor controls and ENERGY STAR® refrigerators and dishwashers. ← Considering Energy Efficiency Upgrades?